Adventures of Captain Rochester #4! 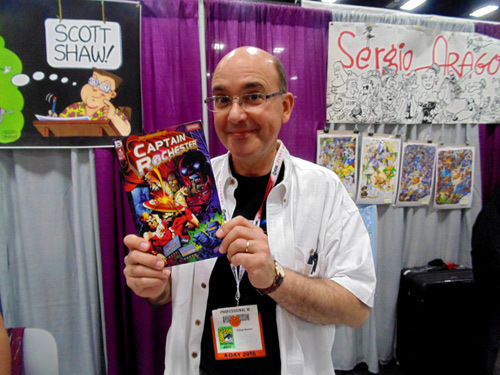 TODAY'S FEATURE IS BLOG #4038 - During each year's San Diego Comic Con International I made sure to visit Scott Shaw's booth on the exhibit floor. I was there on the first day to check out what Scott had for sale. Unfortunately this year Scott was a 'No Show' due to illness. His son Kirby was to be at the booth. Instead when I made it to the booth, I saw George Karalis, who was running the booth. I've blogged about George several times before, as he is the writer / editor of Rochester Electronics Publications. That company publishes 'The Adventures of Captain Rochester' which I have blogged about also. So I am well aware of the comic book series that George is shown in the photo above holding. However, I had not seen that latest issue, number 4, until seeing George again at Comic-Con. Scott is the artist of the series, (since issue #2), and George was glad to see that I obtained a copy. The issue is comprised of two different stories. Both stories are part 2s of stories from issue #3. Oh, and here is the link to where I review blogged issues #1 & 2. The first story was co-written by George Karalias & Paul Gerrish, with art by Scott Shaw!, inking by Mike Kazaleh. I found that even though it was Part 2, and I had read issue #3 with Part 1 quite a while back... I found this continuation to be as entertaining as the first part. The second story was also continued from issue #3, and it was also easy to pick back up on. I believe it is the cartoony art of Scott that made it easy to pick back up on. All in all, this issue was a good read! I like the fact that since this is a promotional comic book, on behalf of Rochester Electronics, that industry tidbits are included on the story pages. That is because 'Rochester Electronics leads the industry in the fight against counterfeiting! Which what both stories in this issue are aboout. My hat is off to these comics creators. They have continued to make a promotional comic book series into a good read! I would give this issue a Near Mint (NM) 9.4 out of a 10.0 comic book grade. For more info on this series, please see their Facebook Fan Page, and the website for Captain Rochester. My thanks to George Karalis for bringing this latest issue in the series to my attention at the 2015 San Diego Comic Con International! Addendum: For copies of these four Adventures Of Captain Rochester, I still have a few left at my online comic book shop, ComicBooksCircus.com! 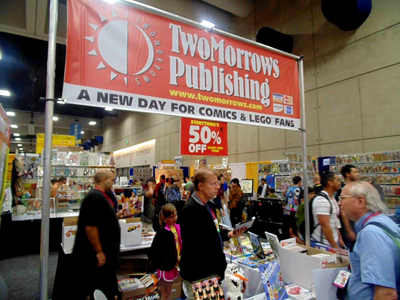 TODAY'S FEATURE IS BLOG #4037 - This past 2015 San Diego Comic Con International I made sure to visit the TwoMorrows booth on the exhibit floor. I was there Friday to pick up the latest issues of the Jack Kirby Collector that had been printed since last year's SDCC. I'll review blog those later here in this blog. Then as usual on a late Sunday afternoon, I hit the publishers / dealers for any last minute deals to be had. Why? Well that issue had a cover that was very familiar. Sol Brodsky was on the cover. Actually an illustration of Sol drawn by John Romita Sr. 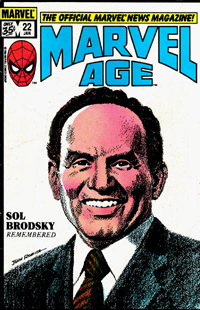 It was the same image I had seen years ago, on Marvel Age #22, when the comic publication was remembering Sol Brodsky soon after his passing. Remembering how much I enjoyed reading more about Sol, I thought I would give this magazine a read, as on the cover it also stated: Rememberances By His Friends... John Romita, Stan Lee, Herb Trimpe, Stan Goldberg, Daid A Kraft, and Roy Thomas. Plus an article by Janna Parker, (Sol's daughter). So I finished reading it last night. 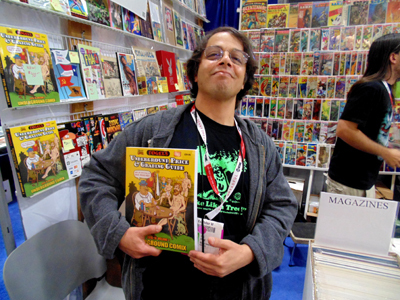 Pretty darn good treasury compiled by the Editor, Roy Thomas! On the Table of Contents it showed a 7-Part Section on "Sol Brodsky - Stan Lee's 'Right-Hand Man". Part One was the Editorial: 'Better Call Sol' on page 2. Page 7 was Part Two - "Dad Loved Comic Books" - An interview with Janna Parker, Sol's daughter. Part Three was "Sol Was A Great Company Man" - Stan Goldberg's story of Sol. Stan was with Sol during the Timely / Atlas / Marvel years. Part Four: 'A Eulogy By Stan Lee'. Page 35 had 'A Few Choice Words On Sol Brodsky' - written by John Romita Sr.
Part Six had "We Need A Lot More Guys Like Him" - Interview with Herb Trimpe on Sol. And Part Seven had: 'For The Love Of Sol' - David Anthony Kraft worked with Sol at Marvel & also at Skywald. Interesting stories by David on Sol. The Seven Part Section on Sol Brodsky was worth the cover price for me! I had seen credits by Sol Brodsky in the early Marvel years, as he was an inker as well. I mentioned I had read the Marvel Age #22 back in 1985 after Sol had passed. Here is a scan of that cover. Not many 'production' people got mentioned on Marvel Comics pages, but Sol and also Flo Steinberg were a couple of the exceptions. I had also picked up a few of the 'Skywald' Comics during its brief publishing period. 'Skywald' was named after Sol BrodSKY and Israel WALDman. The circulation of those comics and magazines were sparse in the San Diego area during 1970 - 1973, bnut I was able to pick up a few off the newstands. Here is a link to all of the Skywald publications. 'Seal of Approval: The History of the Comics Code' - Continuing Chapter 6 of Our Serialization of the 1998 Study by Dr. Amy Kiste Nyberg. This article was very good in presenting its topic. I viewed good photos of the publishers involved with the Code, as well as comic book issues that either helped change the Code or were published after the Code was revised. Very good presentation! Dan Barry & Flash Gordon Part III was okay for me, since it was Part III and I hadn't seen the earlier two parts, it took me a little while to catch up. Mr. Monster's Comic Crypt column was pretty cool! The article was on 'Real Clue Crime Stories' comics published by Hillman Periodicals. I have not read any of the comics in this series, so this was an introduction to me on the series. Thre was also... "Alter Ego's Multi-Part Tribute To G.B. Love & RCC - Part 2'. Five pages on G.B., which I enjoyed reading. Lastly there was an obit on Stan Goldberg, (1932 - 2014), whose work I had enjoyed over the years, at Marvel & Archie Comics. I had met Stan at Comic-Con International and took in a panel on him a few years back as well. Stan was the main colorist during the early years of the then new Marvel Comics, and he chose the colors for the characters. FCA #193 was included in the back of this magazine, with emphais on Fawcett's Invasion of France. Captain Marvel comics printed in the French language. This was a real fun magazine to read! I would have to give it a Near Mint (NM) 9.4 out of a 10.0 comic book grade. You can find it online at this link for purchase. Addendum: For further reading on Sol Brodsky... See his Wikipedia entry, and his GCD entry. TODAY'S FEATURE IS BLOG #4033 - I've mentioned already that I attended all four days of the 2015 San Diego Comic Con International in this Blog. Well, besides attending panels, I also hit the exhibit floor several times, and on Saturday I ran into Dan Fogle at his booth. He mentioned to me about the new edition of his Underground Price & Grading Guide, and that it was being published in two volumes this time, as there was so much data to print. So I walked away with a copy of his Guide. I've already mentioned his supplement edition that was previously published in blog #3148 back on May 28th of 2010. That was a while back! So, as you can tell by the previous archived blog, I have interest in this topic... Underground Comix (UGC). Not that I had that many when I was younger, but over the years I have picked up and sold a few collections that contained UGCs. So I have picked up info rather 'piece-meal' on UGCs over the years. First, the price section. The pages all have a normal sized font, which makes it easier to read, at least for older guys like me! There are two columns on each page, so there are a lot of listings on each page. At the top section there are four examples of UGCs shown for Good, Fine & Near Mint Minus grades. Each title is listed first, then with the name of the publisher. Then the issue numbers along with date of publication. Many UGCs have been reprinted over the years, so each one of those printings are listed and shown with prices for the three listed grades. I found this price guide to very informative and comprehensive, from A to Z. I liked the layout, the normal sized font, and the listings shown. Okay, so much for the Price & Grading sections of this guide. So what else was there to make this book so thtick? Well, there were several articles! . Page 9 - The Preface by Dan - Good to read for a first time buyer of this Guide. Page 12 - Dana 'Ma' Crumb - good story by John Orlando, Jill Orlando & Dan Fogel. Page 18 - Spain Rodriguez - Feature Film In The Works by Dan Fogel. Good update on this film. Page 21 - Underground Market Report - Several reports by UGC dealers. Always good to know what is going on in the back issue sales! Page 23 - Slab This! Good interview on why there aren't that many high grade UGCs out there! Page 25 - CGC - How The Company Has Grown And How It Works - Good article on the topic. Pages 49 thru 64 - The first color section in this Guide. Full page presentations of the UGC creators chosen and some of their works. I enjoyed seeing these pages! Pages 272 - 273 - Photos by Bob White of a 1985 gathering of UGC creators at Hi De Comics. Pages 278 - 280 - Richard 'Grass' Green - Black King of Underground Comix - This was a neat article on Richard. I had known about his above ground comics career, but this article about his UGC experiences was pretty neat! Pages 286 - 287 - Underground Rock and Roll Comics Revolutionaries - article by Jay Allen Sanford. Good two page history of Revolutionaryh Comics. Pages 305 - 308 - Origins and Influence of Zap Comix - by Robert Beerbohm - I've sat through a few panels with Bob discussing his knowledge of comics & comix, And enjoyed them! This was a good article on the topic. Miscellaneous pages, both in b&w and in color, on dealers selling their wares. Interesting to see the names of those still in the business after all these years! Plus a lot of new names who are now selling UGCs. All in all, I believe that Dan has another 'hit' on his hands with this Volume 1. I can't wait for Volume 2 to be printed! Oh... My comix grade for this Volume? I give it a Near Mint (NM) 9.4 out of a 10.0 grading scale. If you don't see Dan at a comic convention near you... Here is the link to where you can buy it from via the mail..
My thanks to Dan for letting me know of his latest publication! 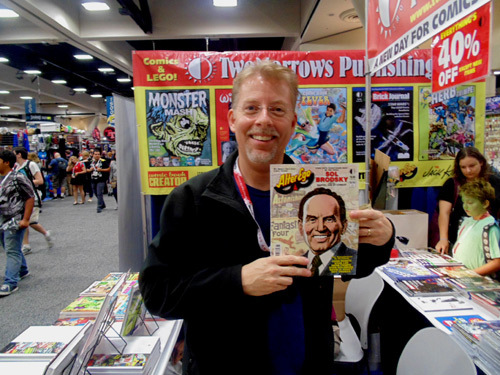 TODAY'S FEATURE IS BLOG #4009 - One of the activities I like to do each year at the Comic-Con International is to stop at the TwoMorrows booth! I usually do that on Sunday, right after attending the Jack Kirby Tribute Annual Program hosted by Mark Evanier. This year was the 20th Anniversary of Jack's passing. Good tribute panel and there was a good selection of publications at the TwoMorrows booth this year. One of the publications I chose to pick up was Jack Kirby Collector #63. Yes, I have blogged on this publication a few times over the years, but it remains to be one of my favorite publications to pick up at Comic-Con each year! This issue's theme was 'Marvel Universe'. Which featured Mark Alexander's pivotal Lee/Kirby essay "A Universe A'Borning". I have already read issue #58 titled "The Wonder Years" also by Mark Alexander, which really went into depth on the Lee / Kirby years. See blog #3682 where I reviewed this publication. This issue #63 was more of an essay in format, but just as interesting reading at the earlier publication. The front cover to #63 was a double page spread. Really nice! Mark mentioned that the essay had taken 5 months of hard work to create. The photos / illustrations were very helpful in getting Mark's points across to the reader. The 34 pages in this essay would be a good entry point to turn a friend into finding out about Jack Kirby. I found this to be a highlight of issue #63. Pages 37 - 47 was a section titled 'Mega Marvel Pencils', with the original artwork penciled by Jack Kirby with notes about each page presented. Nice! Page 48 was a one page update on the Jack Kirby Museum. Pages 49 - 63 was a 2008 Jack Kirby Tribute Panel, presented at the Big Apple Con in New York City. I have sat through 20 of these panels now, and find each one has something different to present on Jack. Pages 64 - 66 was the Kirby Obscura section by Barry Forshaw. Pages 67 - 69 was Kirby Kinetics by Norris Burroughs. Good tie-in with King Kong. Pages 70 - 73 was a section by Shane Foley, titled "By Theire Enemies Shall Ye Know Them". An interesting topic was covered. Pages 74 - 81 was a section titled "Key Late Career Moments"84 - 85 from the early 1970s to 1994 when Jack passed. Some of these dates I didn't know what had happened. Pages 82 - 83 was the section titled "Incidental Iconography" by Sean Kleefeld. Interesting notes on Triton the Inhuman. Pages 84 - 85 was on FF #110: The Lost Collage. I kind of knew this story. Pages 86 - 88 was a regular feature: Kirby As A Genre. Pages 89 - 90 was a new feature: Unearthed - The Lone Survivor. Pages 91 - 92 was the letters page: Collectors Comments. Pages 93 - 95 was the house ad showing earlier Jack Kirby Collectors still available for sale. Page 96 was the one page feature titled "Parting Shot". Once again John Morrow and feature contributors assembled a fine publication! This one was chock full of Marvel Universe items. Definitely a good buy at $10.95 cover price! This is something that would be considered a good gift for a friend. I highly recommend this issue! It definitely covers "The Marvel Universe" which Stan Lee & Jack Kirby basically co-created! NOTE FROM Michael D Hamersky On Comics: My thanks again to all of YOU reading this blog and our archived blog posts, now at 4,009 total posts in number! I do appreciate your continued reading and support of this Blog! TODAY'S FEATURE IS BLOG #4007 - I blogged earlier this week that I didn't have a full four day membership at the Comic-Con International. Yeah, that's right, after attending every day of the Con since 1991 straight, I missed out on this year's convention due to the new lottery system of obtaining badges for each day. So on Friday of con week I attended the Off Site Events that sprawled around the front and back of the San Diego Convention Center. You can see photos from Friday at this link to my special Facebook Fan Page's photo album. One of the events down to the East of the convention center was the Wonder Bread Building. It was right across the street from where I used to work at, San Diego Rubber Company / Hoffmeyer Company. That building where I worked is now part of the large parking lot for Petco Park. The Wonder Bread Building was hosting the 2014 Art Expo, which was on both the bottom and second floors. There I walked around for a while, and at one of the exhibit tables a publication jumped out at me! That publication was titled 'BEDLAM', by Mark Todd. It was a 'mash-up' of a Fantastic Four cover, one that I remember quite vividly. Fantastic Four #98 from May of 1970, the month before I graduated from Mar Vista High School in Imperial Beach. Also, this was one of artist Jack Kirby's final issues in his 102 issue long run on the Fantastic Four. Well, I just had to skim through this publication. Wow! Even more mashups inside! The Amazing Spider-Man, Tales To Astonish, Avengers, Daredevil, Incredible Hulk, Eternals, and more Fantastic Four! Issues that I had enjoyed when first picking them up on the newstands. Sheesh! All this in one publication! Then I met the creator of this mash-up. And we talked... and talked. 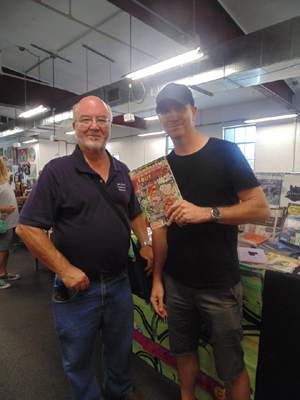 He explained he had picked up his first comic at a 7-11 in 1983, Iron Man #179, and he had started reading, bagging and collecting comics right then. He also started some illustrations of the comics. He couldn't move to New York to pursue comics, but instead became an artist in other genres, which is why he was at the Art Expo. This 'Bedlam' was such a great publication that I purchased it before leaving his exhibit table! You too can do so, by checking this link at his website. There are more photos there of the interior pages as well, so you can see what you are buying before doing so. I also took the time to videotape him, and I will be uploading the video at my YouTube channel. Here is the link to that, when it is uploaded. My thanks to Mark for sharing his background on how he came to do this 'Bedlam' mash-up! NOTE FROM Michael D Hamersky On Comics: My thanks again to all of YOU reading this blog and our archived blog posts, now at 4,007 total posts in number! I do appreciate your continued reading and support of this Blog!